Our DIY solar generator how to series has been really successful with lots of great feedback! I have had at least 20 – 30 subscribers mention in the comments or emails that they have built one of these units and are very happy with it. Even several people that initially were not sure they would be able to build it, have later told me they successfully built one. Thanks for the great feedback, I always love hearing from the people that have built them! I just posted another video to YouTube with some additional updates based on my own usage of the solar generator, as well as a couple changes due to parts availability. We needed to switch to the 3,000 watt inverter, as the 2,000 watt version we originally used in the how to videos is no longer available. I also will be upgrading the external switches to a water proof version. Finally we will be reinforcing some of the higher stress mounted components, such as the high current quick connector with epoxy instead of hot melt glue. Check out the video here, and I have posted links to the new updated components I am using below! Below is a list of components used in this post and their current Amazon prices. Hello, I been following your fantastic videos and planning to build the generator. I have a question about the inverter and whether to get a modified or pure sine wave inverter and a question about the solar controller. I see the cost of the pure sine wave inverters is considerable higher than a modified sine wave inverter of equivalent wattage. I’d be looking to use my generator for camping trips powering some tools in my shed that doesn’t have other power and for short power outages for lights and to keep the fridge going. Charging phones and powering a radio/small tv would also be important. 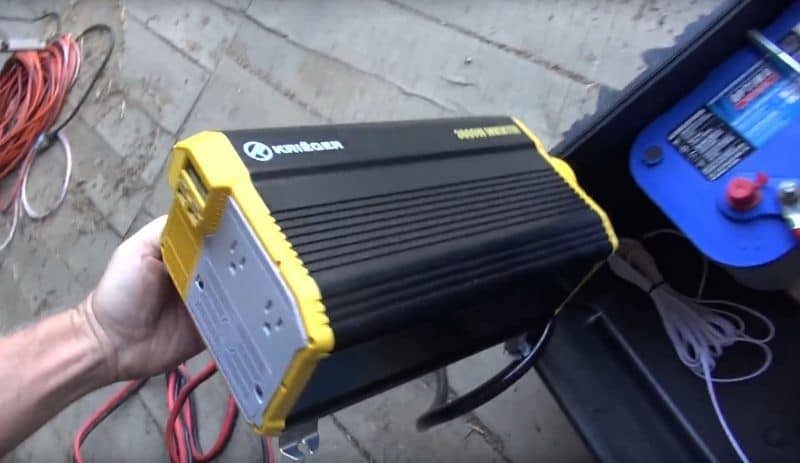 Would it be worth it in the long run to buy the PSW inverter up front, or maybe get the MSW and a smaller PSW for the loads that specifically need it? Looking for your opinion. As for the controller, any particular reason you chose the PWM controller over MPPT type controller? Again, there’s the pretty big cost difference. Just wondering if you explored the MPPT option. And thanks again for posting such informative videos. Thanks Chad, and excellent questions! I have read a lot of information on the Pure Sign Wave vs Modified Sine Wave inverters, and still not much closer to a clear answer. Many will say the more expensive PSW inverters are mandatory for electronics, others will say hogwash and that all quality electronics have plenty of input power filtering and will run just fine. I find the fact that the vast majority of Battery Backup UPS units designed specifically for computers and office equipment use the less expensive MSW inverter, just like we are using, to be pretty telling on this end of things. I have also read that some AC motors run better on PSW. This could be true, but I haven’t ran into any problems so far. I did notice a box fan buzzed / hummed a little louder, but seemed to operate just fine. I would say a good plan is to have a high capacity MSW inverter for a good price like we are using for the majority of stuff, and then if you notice some of your equipment is not operating like you expect, a smaller PSW for those loads would be a good addition. Similar for the PWM vs MPPT. I went with the PWM charge controller because it was bundled with the solar panels I used and at a great price. The MPPT charge controllers certainly have an edge on efficiency, and will squeak in some additional charging each day from the same amount of sunlight. Whether this is worth the extra cost just depends on how often you plan to use the solar generator. For occasional use like mine, I went with the less expensive PWM. If I was setting up a system for full time, year round everyday use, I would have upgraded to an MPPT charge controller. Iv been racking my brain over the pure vs modified. Finding a pure that is 3000watt and fits in my case is a bigger challenge than anything. I got a used Pelican 1650 case so I have a little more room and am going to start with the VMAX 125ah battery and skip the LiPO for now that I mentioned a few days ago. I like the idea of having an additional smaller pure inverter for some electronics. I’m almost exclusively a prepper so in SHTF I will most likely be recharging AA/AAA/CR123 batteries and operating other small devices and I would hate to damage these devices as the will be almost invaluable in such a situation. My question is, is there any reason I couldn’t wire this inverter to the battery as well and have it mounted somewhere in the case?? I would run a separate plug on the outside of the case dedicated for this inverter. I do plan on running GFCI just for fun and added protection. I did pull the trigger on the Krieger 3000 today. So il probably add a 500 or 1000 watt pure sine somehow. Likely will depend on space! Makes sense Rick! 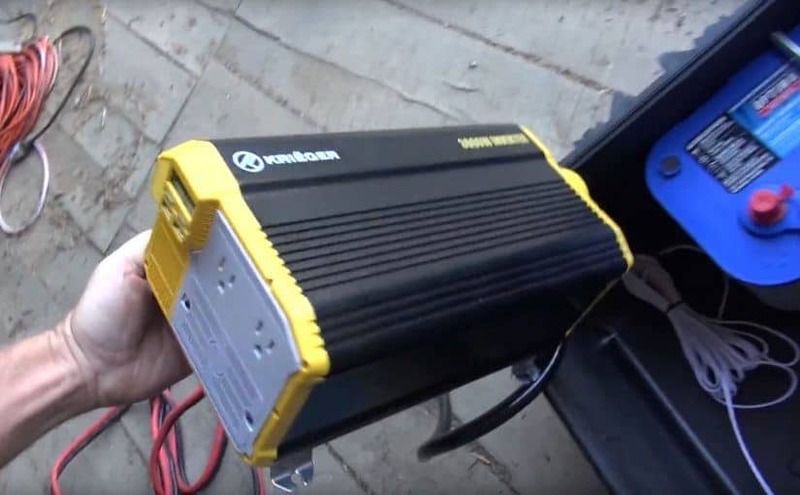 Yes you can add a second inverter wired directly to the battery, just like the first. Make sure you also fuse it with the recommended fuse size, which should be listed in the installation instructions for the additional inverter. Mark, thanks for the reply. I’ve though of two more question while researching the components. I’ve been looking at the LIPO4 batteries. More expensive, certainly. But stands to reason that since they have more of a discharge capacity than the lead acids, one could get a smaller AH battery and still have a similar capacity as a larger lead acid, and since the LIPO4s last longer, cost may equal out in the long run. Also, aside from the volt meter, what other devices could be used to measure and track usage and remaining battery capacity? I’ve looked at the bogart engineering trimetric meter, but that looks a bit overkill for the powtable generator. Could you please assist with the link to all the materials you used in your solar power generator? Really like your design and mods. Keep up the good work. thanks for all the work you have done on the build for the generator. I am collecting all the components and will start my build next week. My original plan was to mount on top of the toy hauler but decided that this was a more usable solution. Will be building a carry case for my 200 watt flexible solar panels will post video when complete look forward to your next project. I would like a similar system for home as well as portable. i am having a 50 amp inlet plug added to my breaker box in case of emergency. my question is, can i run this as a 50amp? just get the proper controller to do this? i would also like it to be 2 of the 3,000 watts and found some with a built in 50amp controller. sorry for so many questions and keep up the great work you do. like what you have done with saving money for getting the most bang for your buck. what is required to add wind turbine to your system and what additional equipment would be needed and size to allow different types of power source..
Next Next post: Kubota B20 Moves Under its Own Power!